Hello people! Actually, rainbow hello would be more appropriate! 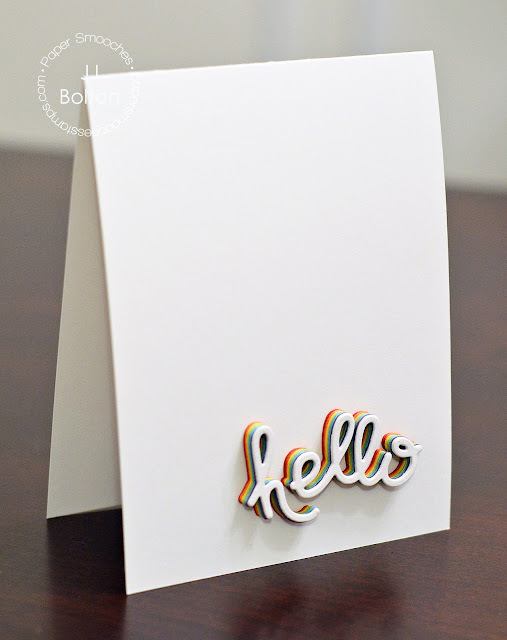 I have a Paper Smooches card to share today using one of the new Hello Word dies. This set comes with 5 different dies, and I love each one of them! [I apologize in advance for the wonky pics! I had a heck of time taking clear photos of this card. I think I'll try again in the daytime.] I had so much fun putting this card together and I love how it turned out! I been wanting to try this technique for a while, and this die was just what I needed. All I did was cut the word in each color of the rainbow twice (you need good, thick cardstock for this to really work). Then it was just a matter of stacking and gluing them together. The result is a beautiful 3D rainbow about 1/4" thick. So much fun! That's it for me today! I hope you go check out all the new Paper Smooches goodies this month! great CAS card; thanx for the inspiration! I thought perhaps you'd used fun foam and had to read the details to see it was cardstock! So creative & CAS! I don't yet own any word dies. I'd love to win one! Oh, this is so cool, JJ!!! CAS to the max with full impact! Wow, love your card, JJ. I first thought it might be foam, too. A beautiful card.... love the dimension and all of that lovely white space! That is amazing. I love the depth it provides, almost bordering on sculpture. Wonderful card. I just love this card... very colorful. I just love rainbow colors in my cardmaking. Tks for opportunity to win some blog candy! You always come up with the most creative ideas! So glad you shared this one! I've been wanting to try this technique for a while, totally love that you made it a rainbow! This is so cool. Love the rainbow of papers against all that white! Happy New Year JJ! I've been meaning to try the layering technique myself (still haven't) but you've added a whole new dimension ( no pun intended). Love the rainbow effect of this utterly CAS card. I love it, it loves great. What a great idea! 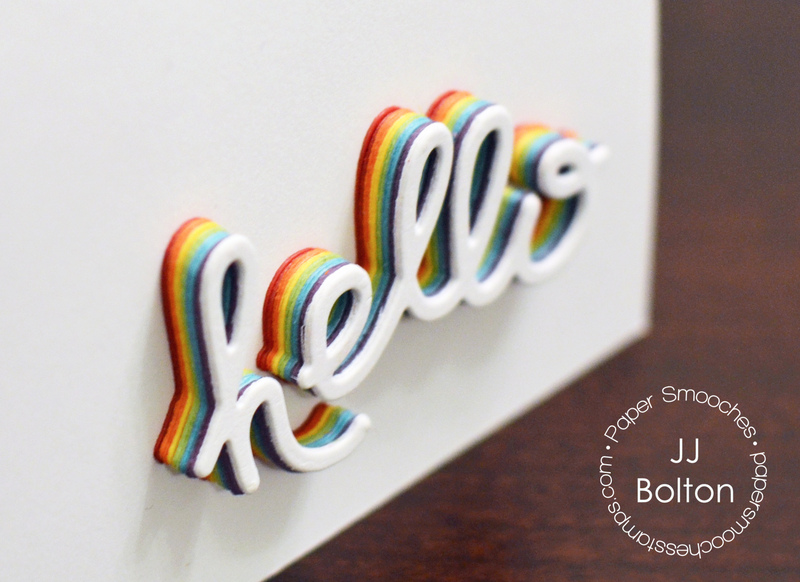 LOVE the look of the rainbow word...simple yet striking! Such a clever idea. Love it! Eeekkkk! I love this! I love rainbows so this just makes me happy over and over again! LOVE how high it sticks up and of course the cool rainbow. So CAS, but such a huge impact! This is a fabulous simple card! I can't wait to try this! Love the look you created here! Great effect! Love stacking my dies but didn't think of the rainbow effect! How cool. TFS!!! what a cute idea. I love how easy it is and packs a lot of punch. so colorful. Fabulous card! LOVE it! Thanks for the chance to win! Aloha! This card is so simple and so fun! Love the rainbow effect! I think you did a marvelous job taking pictures and your cards are just fabulous too!!! How do you adhere very thin die cuts (like letters) in layers without having glue leak out? What a unique card...love how it turned out! WOW, WOW, WOW, WOW, WOW...I can't think of anything else to say. WOW! This is any awesome card. I always find so much inspiration and new techniques in your blog. Thank you for sharing! Ohmygosh - i love this technique! I'm going to try it right now! This is Adorable!! I LOVE the fun effect!! This is stunning JJ!! Such a simple idea but packs such a punch!! Awesome!!! I love this idea and this look! Would also sure like it to win anything Paper Smooches…and tidbits, too! Thanks! Super cool idea, JJ! Love the rainbow colours and what perfect CAS card. Love it. How fun, JJ! This reminds me so much of Rainbow Jello--the layered dessert! How awesome this looks, JJ! Love this technique! Love this fabulous card! Great job! Adore the rainbow - such a fun happy card! Would love to know what glue, etc. you used to put the layers together. Absolutely amazing, JJ! You are so incredibly clever!!! Love your awesome card! The die cut is just amazing and so creative! I love your card! What a fantastic idea! I guess I need to get some word dies! Wow I have seen word dies stacked but never as a rainbow...it is so beautiful and creative! Thanks for the wonderful inspiration! What an awesome card! LOVE the idea of stacking in rainbow colors! FAB!!! Stunning! Love the clean style, and the amount of white spaces makes the rainbow that much more striking. JJ well that is certainly beautiful and striking! TFS I need to try out this technique. JJ, this is the best demonstration of this technique I have seen so far! You really need a good die and not too flimsy fonts. Love the rainbow effect!! Awesome card! I love to the look of a clean and simple card such as this one. Thank you for sharing and thank you for the chance to win. This is one of those cards that makes me go "why didn't I think of that?!" This is so so AWESOME! What a fantastic idea!!! So simple and yet so outstanding, brilliant design!! And thanks so much for the chance to win! Love the rainbow look! TFS!!! I am loving this technique! Very fun card! Love the rainbow look! JJ. Seriously? This just took my jaw to the floor! Absolutely AMAZING concept and beautifully executed!!! WOW! TOTALLY love this! I love visiting your blog for inspiration. Thanks for the great giveaway! 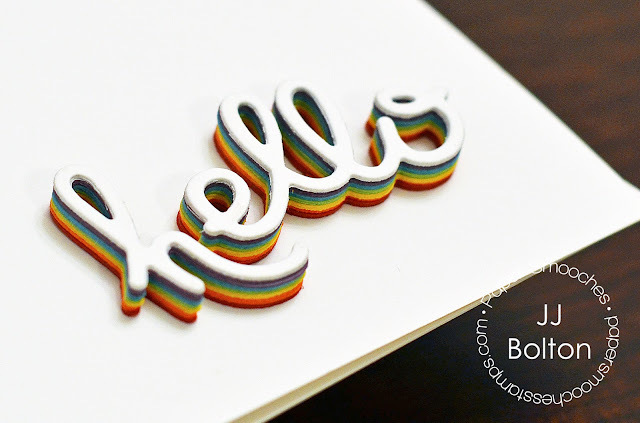 I love the rainbow effect with the die cut HELLO--reminds me of some rainbows I saw in Hawaii...thanks for making me smile today! OMG! Another crazy good over the top idea JJ! I love this!! Just saw it on the Paper Smooches ad and KNEW it had to be you! WOW! This card is a great example of flawless technique and beautiful white space. when you say thick cardstock - how thick does it have to be/what weight did you use? all my cardstock looks for too flimsy to even try! Love this card, what a super idea!!! So simple but so stylish!!! What a WOW card..... thats a amazingly simple idea!!! !